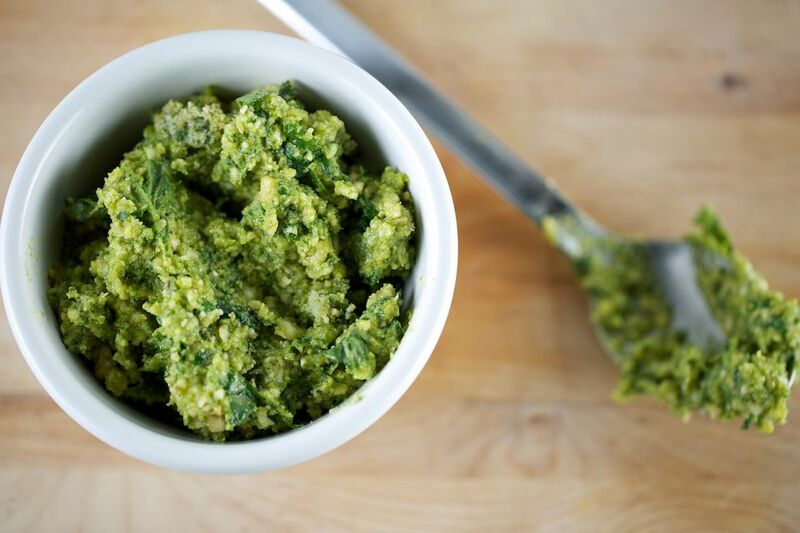 This vegan spinach cashew pesto has many uses, and it takes less than five minutes to whip together. Use it on pizzas (like vegan whole wheat pizza or ​no-rise gluten-free dairy-free pizza, or even ​vegan pita pizzas), wraps, sandwiches, crackers, veggies, or on anything that needs some extra texture or flavor. Because this recipe uses cashews instead of pine nuts, the pesto has a nuttier flavor and a bit more body, and because it uses spinach along with basil, the flavor is mellower but as a food, it's a powerhouse condiment that's loaded with nutrients. If you prefer, you can always use a vegan Parmesan cheese substitute in place of the nutritional yeast, but take care to read the ingredient list to make sure that there are no hidden dairy ingredients like whey or casein lurking in the list. Note: you may not need to use the full 1/2 cup of olive oil, and you may decide to use more. For a thicker, spread-like paste (if using on sandwiches, etc), use less oil; for a thinner pesto (to be used on pasta, over tofu or other proteins, etc), use more oil. (For example, if you like your pesto a little on the chunky side as you can see in the photo, aim not to over blend and instead just to get everything to adhere and flavors to meld together without losing that delicious texture. If you, however, like a runnier or more lemony pesto, add a few more tablespoons of olive oil and a tablespoon or two more of the lemon juice.) Basically, just add oil until the pesto looks right for your dish and palate. Place the fresh spinach, fresh basil, garlic, nutritional yeast, fresh lemon juice, sea salt and finely ground cashews in a food processor or blender, and blend for just 30 seconds or so, or until forming a chunky mixture. With the processor or blender still running, stream in the extra virgin olive oil until all has been added and add more as needed to achieve the desired consistency. *As with any recipe intended for persons with dietary restrictions or allergies, make sure to read the ingredients labels on all ingredients to make sure that there are no dairy-derived ingredients or other allergens that apply to you. This recipe as written is suitable for dairy-free, lactose-free, vegan, vegetarian, gluten-free, and ​wheat-free diets.